I’m glad to report that I’m alive and well after Irene blew through. 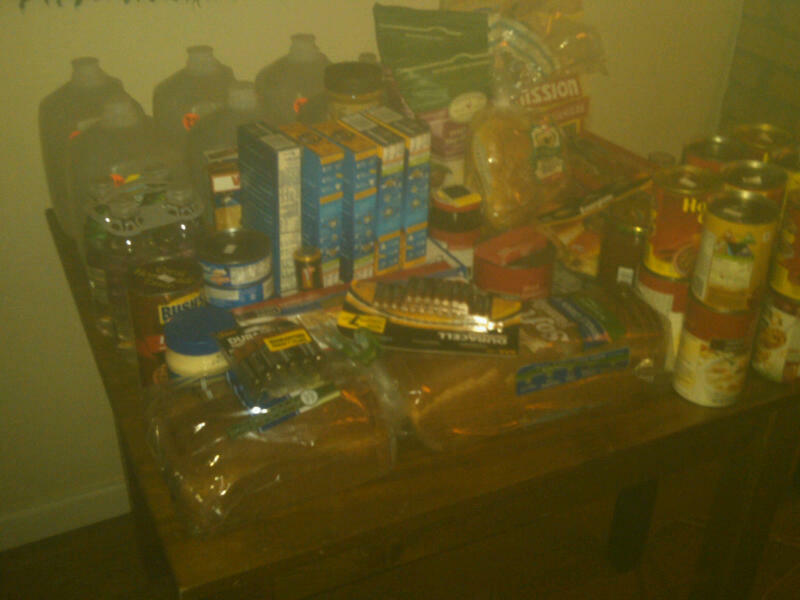 Nick and I prepared for the storm the only way we know how to do things: in excess; and invited over some friends from low lying areas. With 6 people, one dog, one bird, and one hurricane turned tropical storm it was more party than shelter. Staring down the risk of a multi-day power outage our brilliant idea was to make gumbo. An insane amount of very perishable seafood gumbo. Nick had picked-up sausage and shrimp so, in Irene’s first burst of rain to hit Brooklyn, I made an 11th hour run to Union Market. After trying to shop through the chaos for 5 minutes I realized that the line snaked through the whole New York sized store (aka small and cramped compared to anything in MN). So I got in line and shopped the shelves around me as the line inched forward. A pound of okra here, some canned clams there, a little ahi tuna jerky because the guy behind the fish counter was MIA, some seafood stock, and over 3 lbs of bone in chicken legs and and thighs. The thing about gumbo is that there really isn’t a “right way” to make it. The stuff basically came about when people started throwing whatever was around into a pot before it could spoil. So I scoured the fridge, freezer, and cabinets and found some great additions. There was the frozen chicken stock I had made a while back. Some lamb bones that I have had sitting in the freezer forever waiting for a chance to turn them into stock. Some onions. Some cherry tomatoes. A bunch of mushrooms. It was time to get things rolling. Oh, one other thing. Two visitors, who will remain nameless to protect their shameful tastes, don’t like strong seafood flavors and said they won’t be able handle the clams or the other fishy goodness–despite my assurances that the gumbo would be more savory than seafoody. The solution: two pots; one purely chicken and sausage based the second having chicken, sausage, and the seafood elements. To start the gumbo, cook the sausage (cut into circles) in a big pot using a little oil. Once the sausage is done, pull it out of the pot, set it aside and give the chicken (you should really be only using bone in dark meat here) a solid little fry in the oil. Once the chicken is done or doneish pull it out and set it aside. Now make a little rue with the oil in the bottom of the pan. It’s the rue and the okra that thicken the gumbo. Once the rue has cooked nicely (maybe 5 minutes or so), add some stock, whatever kind works. Or just use water, there are plenty of flavors coming to go around. In this case, I used a mix of the seafood broth I picked-up in my shopping adventure, chicken broth, and some water. Next add a bunch of Orka, cut into about half to quarter inch pieces–don’t bother being delicate, they completely vanish after a few hours of cooking. Oh, and don’t forget to put all that meat back in along with whatever else you’ve found laying around. Then you let it cook and cook and cook. As the rain fell and we tapped into the large provisions of beer the gumbo cooked away. Every 15 minutes or so it’s important to stop by and give it a good stir and scrape the bottom of the pot. Slowly but surely everything in the pot becomes one. First the okra just vanishes. Then you notice the shrimps have gone and some meat is falling off the chicken bones. Suddenly there is no more meat on the chicken bones. The main solids left are the sausage chunks and what looks like pulled chicken. This is one of the reasons I highly recommend having a little crab or something to throw on top before eating. Another, as of yet untested, thought I have is to retain another batch of shrimp and fish to put in for the last 30-45 minutes of cooking–that way after the base has it’s amazing flavor from the disintegration of ingredients there’ll still chunks of those delicious ingredients to be had. First, in a medium bowl whisk the eggs so that you get some air bubbles in the mix. Next add some buttermilk (if you don’t have buttermilk around you can make a good substitute by mixing one cup milk with a tablespoon of lemon juice). Let that mixture get up to room temperature. Next, melt the butter in large skillet. Remove from heat and stir in sugar. Then add the sugar butter to the room temperature egg/buttermilk bowl. (Note: if you didn’t let your eggs and buttermilk get up to room temperature everything will fail here, the sugar and butter will get cold and start turning back into a solid.) Whisk the liquid for a bit. Combine the dry ingredients in their own bowl. Now slowly whisk in large handfuls of the dry ingredients into the liquid and keep whisking until there are little or no lumps. Then put the batter into a greased baking pan. Spoon a smattering of creamed corn onto/into the batter. Finally, sprinkle the sharp cheddar on top and bake for about 30 minutes at 375 (or until it browns and a toothpick comes out clean). 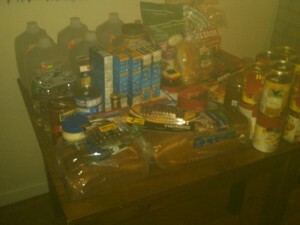 I wish I had a picture of all of this, but, alas, I didn’t have the foresight. Though, with my freezer full of gumbo, a photo op of the gumbo in a bowl, over rice, with a nice slice of cornbread siting on top is sure to be coming soon. Ah cheese. 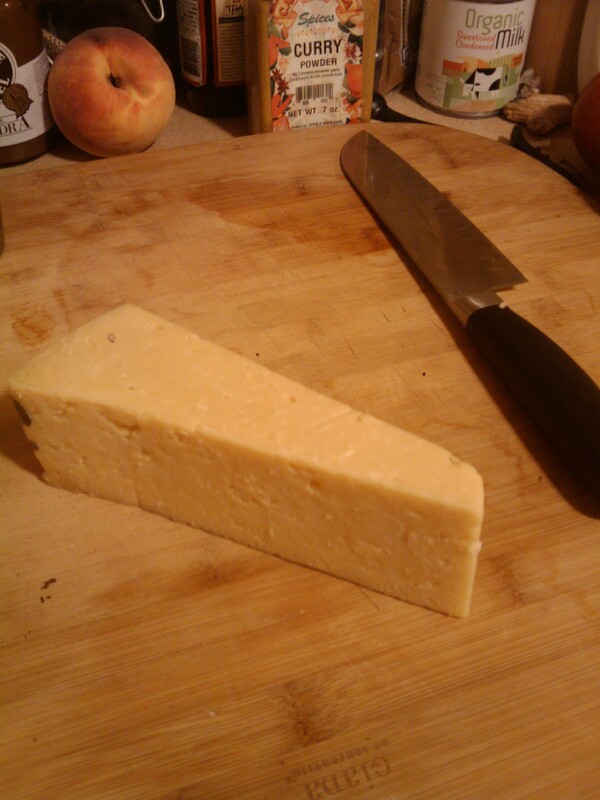 It’s been way to long since I wrote about a new cheese. On my train ride home today I decided to change that. My main goal was to find something I could put on a salad. I stopped by Union Market and scanned maybe 10 varieties of blue… not what I was in the mood for tonight. Then I found something that I hadn’t seen before: Asiago Stella. 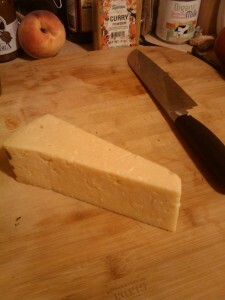 (Well I’ve seen Asiago cheese, but it was always hard as rock or dust, not like the softer, moist looking block before me.) I wasn’t sure about it, but, when I realized that it was about half the price of most of the others, I decided I had to give it a try. It actual turned out to not be great for eating on its own–a little bit dense and a little mild. But it was prefect on the salad. It has a some what savory nutty flavor and when cut into about quarter inch cube it add a nice dimension of flavor to a salad with some amazing little heirloom tomatoes, some cucumber, and a bit of carrot (all from a co-worker’s CSA). Yesterday, Nick texted me to let me know that he was planning on cooking a great dinner (pork chops with a peach salsa, mashed potatoes, and corn on the cob). I had one job, grab a bottle of wine. I went to the store fully intending to ask someone for help. (Wine pairing is not my strong suit.) 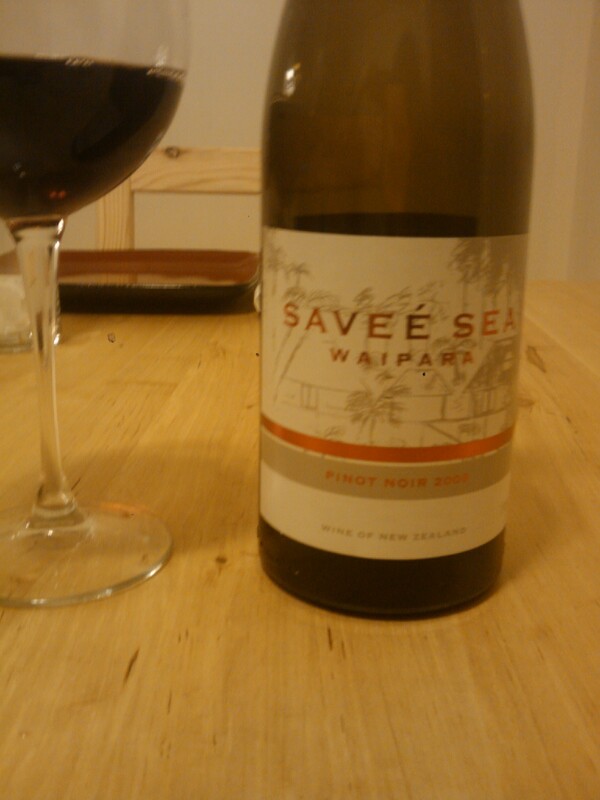 But some where on the way I got fixated on the idea of a pinot noir. And while in the store this particular wine called out to me. Maybe it was the palm tree on the bottle, creating images of a Hawaiian lohou, making think it could go well with pork and peach. Or maybe it was that this boozy grape juice hails from New Zealand and I don’t think that I’ve had a pinot from New Zealand before. I really liked it. The color was a rusty red. It had a very fruit forward nose (in other words it smelled like fruit). I think that Nick’s girlfriend, Becca, perfectly summed up the flavor: fruit basket. I got some plum and pineapple. But it wasn’t overly sweet–the essence of fruit with out all the sweetness. 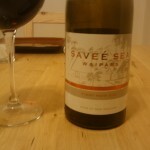 The fruit flavors faded a lot after a few bites of buttery corn and mashed potatoes but the wine remained very enjoyable. All-in-all: it was good with dinner and it would be nice to have a glass on it’s own. Price: $15.99 at Slope Cellars (a bit more than I usually spend, but I’ve been really good and brought my lunch this week and made my own coffee in the mornings). Beer Table is another one of those place that I walked by a million times before finally stopping in. Though in fairness, the streets are packed with more amazing look restaurants than I can hope to take on. In the mile or so walk from my apartment to the gym there must be well over 50 restaurants. But I’m not complaining. There are far worse things in the world than finding a hidden gem just down the street after living in a place for almost a year. Have I mention lately that I love Brooklyn? In July, the final hours of the dark days that were studying for the bar, I stopped in for a little dinner and a beer break. Recently, I stopped back for a second visit. All in all, I love the beer menu, the food is good, but might cost more than I’m comfortable spending. Let me start by talking about the beer. To say that Beer Table has a good beer selection is an understatement. The draft list is 6 beers long and rotates on a regular basis. The bottled beer list, at 25 beers long, presents a wide range of styles. Both the drafts and bottles are beers you’re unlikely to find at a normal bar. It’s a place that will make a beer love feel like the proverbial kid in a candy store. One of the perks of Beer Table is that you can either get a full glass of beer (not always a pint, some of the higher octane brews come in properly reduced glasses) or a smaller taster glass (maybe about 2 or 3 shoots worth). The small glass is great way to try a few new beers and still be able to savor the third as much as the first, with the added benefit of being able to make it work the next day without a headache. Both times I’ve made a visit the servers seemed excited to tell me about their beers and help me find something delicious. On my last trip I sampled the Rogue John Juniper Ale. As the name suggests, it has some strong Juniper elements. (Juniper is a berry that gives gin it’s characteristic flavor.) I was informed by the server that the beer is actually aged in barrels formerly used for gin. And the taste? Imagine a light and delicate gin (think Hendrick’s Gin) becoming effervescent, gaining some beer color, and not without a flavor reminiscent of beer. It’s light and refreshing. I wish had a few of these when the mercury was pushing its way past 100 degrees. I also tried a small glass of Barrier Spelunker a Saison with all kinds of crazy coffee and malty flavors in the mix. This beer convinced me that Saison’s are my current under-explored corner of beer and that I should focus these over the next few months. The food is good. Actually it’s really good. The menu is small, but seems to change regularly. One wall of the bar is lined with jars of dehydrated vegetables. On my last visit, dehydrated tomatoes were prominent in both the “BLT” (dehydrated tomato, mustard-glazed bacon, pickled bok choy) and the spicy pork and beef meatloaf (with Tickle Sauce, potatoes, kale, and red onion). The BLT was small, two little sandwiches with two tomatoes slices holding the pork, each about 2 or 4 bites, but packed a solid punch of flavor (with the dehydrated tomatoes lending a concentrated, almost savory addition). And looking at the prices objectively, they are reasonable. But I’m tempted by so many things on the menu: an entrée, a “snack”, some spicy pickled vegetables (they don’t pull punches on the spicy), and of course some great cheese. I just need a little self restraint on my inevitable next visit and I’ll be fine. The past few days have been an amazing food and beer fueled whirlwind. So much awesomeness and so little time to write. I’m going to focus on the Minnesota State Fair Day (MNSFD) and try not to stray into other topics that deserve their own post including Beer Table (a good restaurant with great beer), Fonda (the best Mexican food I’ve ever eaten), an insane Latvian bar in the Lower East Side (LSE), and Bento Burger (a Japanese styled burger place). Yeah, like said, it’s been busy, but pretty awesome. And, as much as I hate to admit it, it’s been great to leave the comfort of Brooklyn and find some adventures in the city. The 2011 MNSFD, held on Saturday August 20, was a great success. Over 120 Minnesotans and Minnesota-lovers took to the streets of Manhattan to recreate the Minnesota State Fair. Before I go on, since people not from Minnesota seem to get confused, I should explain the Fair. If you’re Minnesotan, just skip this paragraph, you’ve been going to the Fair at least once a year since before you could walk. First and foremost, there is the food. On these 12 days leading-up and including labor day, you can find corn dogs, fried cheese on a stick, fried cheese curds, pork chop on a stick, corn on the cob, Sweet Martha’s Cookies, deep fried candy bars, deep fried pickles, mini doughnuts…. you get the idea: if you can deep fry it and/or put it on a stick you can find it at the fair. (Eating food of a stick is kind of a big part of the experience.) And while, for many of us, the Fair is about walking from food stand to food stand there are actually are things to see and do. The animal barns showcase every barnyard animal imaginable. Scattered throughout the Fairgrounds are various stages with a range of music playing. There are the arts and crafts buildings displaying Minnesota made seed art, jams, quilts, and paintings. The Midway has all the games-you-can-never win and brightly lit death trap looking rides you could hope for. And, of course, there are the horticultural displays showcasing some really big fruits and vegetables born out Minnesota’s fertile soil–many a blue ribbon is handed out. For the first time, tickets were sold for the event with the funds purchasing 40 lbs of Sweet Martha’s Cookie dough and real cheese curds from the same dairy the actual Fair draws on. The City Tavern served-up the famous chocolate chip cookies with an endless supply of cold milk. While it might never be the same as grabbing a bucket of Sweet Martha’s and getting a glass of unlimited milk from the Dairy Barn it was a delicious approximation. 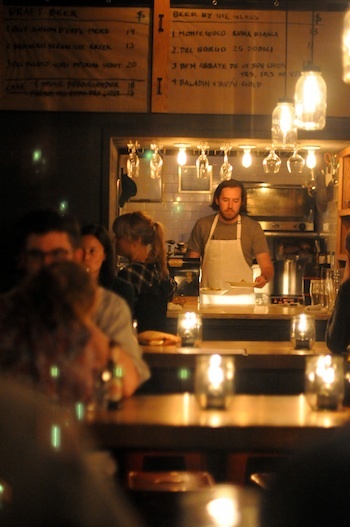 Woody McHale‘s opened their hearts, deep fries, and beer kegs to the group. In addition to deep frying the cheese curds, Woody’s had Leinenkugel (a Wisconsin beer) on tap and gave each ticket holder a glass on the house. While delicious, my one source of sadness was that I couldn’t enjoy my cheese curds with a cold Summit beer–I’m waiting with baited breath for the day this great Minnesota brewery starts distributing in New York. On the route, the planned culinary detours warmed my Minnesotan soul (while raising my cholesterol and increasing my waistline). But more than the food, it was a blast to meet an endless stream of fellow MN-ex pats. Some who have lived in New York for years, others for only a few weeks. I’m looking forward to seeing some of these faces again at the next MN happy hour here in the Big Apple. Finally a shout-out to the event organizers who pulled it all together: Laura Carter, Nina Panda, Jen Wise, Kieley Taylor, Sam Willems, and Shannon Robinson. Thanks guys for making this another awesome State Fair Day! 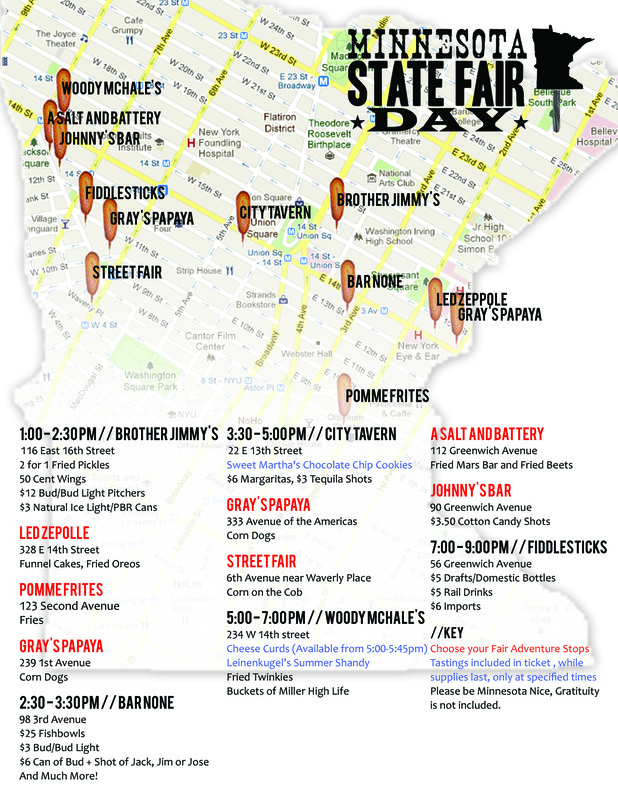 Tomorrow is MN State Fair Day in the Big Apple. The 150 tickets are sold out and the route is set. Since it looks like I won’t be making it back to MN for the real Fair I’m excited to get a few bites of genuine cheese curds and Sweet Martha’s Cookies. That’s right; the MN crew hooked-up the real stuff this year. I’ll be volunteering (tasks unknown), but I’ll be tweeting and following the day up with a post. Ok, now everyone cross their fingers for good weather! Something strange happened to me yesterday morning–something that hasn’t happened in months: on my walk to the subway I stopped in to my usual coffee shop and realized I wanted a hot not an iced coffee. Fall was in the air. After about 36 hours of constant rain, the air was cool and damp. The oppressive heat and humidity seem to have passed. The hard way to make iced coffee is to make regular coffee and put it in the fridge. The easy way to make the stuff is to grind some beans (about two grinders’ worth of grounds) put them in a pitcher with some cool water and let it sit over night in the fridge. That’s it. Under the easy way, after 12 hours the coffee is a little weak, but each day you let it sit the flavor builds. In general, I prefer the flavor of the easy way–a little less bitter. Now all you need is a travel mug full of ice and a little simple syrup and you’re good to start your day. The time? Less than the wait at the coffee shop. You can use sugar instead of simple syrup, but because the coffee is cold the sugar doesn’t like to dissolve and it will make the iced beverage grainy. And making your own simple syrup is, well, simple. You need only two ingredients: sugar and water. Put the water in a pot on the stove, heat to just below any simmering or bubbling, and then add some sugar, stir until the sugar dissolves, and repeat until the water doesn’t seem to be taking any more (e.g. the sugar isn’t dissolving any more). [Or just use the two parts sugar to one part water ratio Rick points out in the comments.] Find a bottle to put the sweet stuff in and that’s it. I used an old, well rinsed, scotch bottle myself. I haven’t done the actual math, but iced coffee always seems to be insanely expensive—it’s time to enjoy some savings along with the last of the warm weather. I don’t normally post links here. But I’m making an exception. The link below shows the true fun that can be found in molecular gastronomy–in opposition to those who see the field as sucking the warmth and love out of cooking. For those of you new to the term, molecular gastronomy is basically using science to break the rules of what cooking is intuitively; for example room temperature ice cream that has no cream. 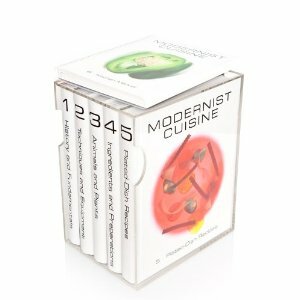 Earlier this year, Nathan Myhrvold put out the Modernist Cuisine, a 5 volume, 40 lbs tome of molecular gastronomy. In the link, the blogger conjures images from Charlie and the Chocolate Factory. I’m sitting down to write this post with a glass of the most intense liquid to ever pass my lips. Ardbeg Supernova 2010. 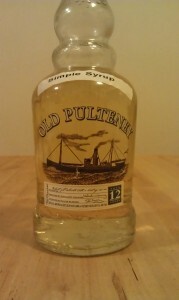 Unlike a normal bottle of scotch this one has a year on it. Like a vintage champagne, the flavors of the limited release shift from year to year. Before I talk about the Supernova, let me back-up and tell you about Ardbeg. Actually, let me first start by talking about making scotch. Simply, you take some barley, you spray it with water to get it to begin germinating (sprouting). Once that starts you hit the barley with some heat to stop the germination. You get the barley sprouting because it converts starches to sugars that the little seed would use to grow but the distillery uses to make alcohol. You stop the germination because there is some magic mixture of starch and sugar that makes a great scotch. In scotch, the heat comes from the burning peat (aka decayed swap vegetation–click on word to see pictures and learn more). This burning peat imparts a peaty (swampy) and smokey flavor. Next the stuff is mashed, fermented, distilled, and put in a barrel. Hailing from Islay, a region of Scotland known for having smoky and peaty scotch, Ardbeg is the peatiest and smokiest, even among the Islays. They let a lot of the smoke from the burning peat get to the barley. It’s a scotch lover’s scotch. Ardbeg Supernova takes the peat to the next level. 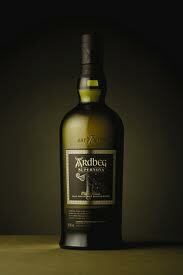 The 10 year Ardbeg has a level of peat that is about 50-65 parts per million. The Supernova clocks-in at over a 100. Oh, and it’s 60.1% alc/vol, in case you don’t want to do the math that’s over 120 proof! So what does this insane concoction taste like? Well, a little water (just a little) is necessary to open up the drink and let you taste some of the hidden flavors. 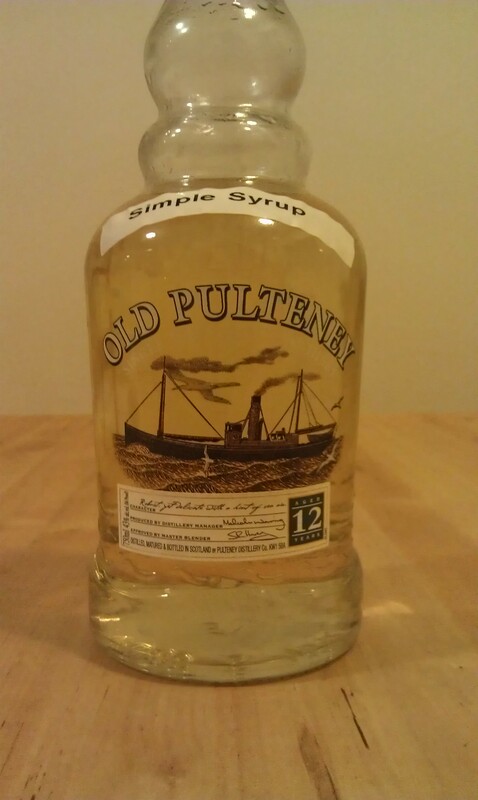 Yes, it’s peaty–though less smoky than it’s bonfire smell would suggest. But the high alcohol content means you taste on your tongue, in your nose, and in your sinuses. You can feel the heat slide across the back of your mouth, down your throat and then up through your head. As the taste rises there is something light and refreshing. I know it’s a slap in the face of flavor, but after the first sip, it doesn’t feel that way. There is so much more going on. Things I can’t put my finger on until the finish. And the finish. Oh, the finish. After a sip, you can just sit, for minutes and feel the flavors change in your mouth: waves of peat, dryness from the evaporating alcohol, hints of smoke, charcoal, brine, maybe some olive oil, and when I breath in a delicate sweetness. In my mind, the finish of this fine drink is where 80% of the flavor can be found. It’s not for everyone, but I’m unquestionably in love. At a price tag that I could only justify as a post-bar present to myself and where a small pour can be enjoyed for over an hour the bottle is sure to haunt my cabinet (occasionally calling my name) for some time to come. A quick lunch with co-workers at Pescatore (Italian for fisherman). The Smoked Salmon Sandwich was good. Not amazing, not innovative, just the smoked salmon, red onions, arugula, capers, and a generous amount lemon dill mayo. Simple and done right—enough for me to want another, to make me trust what they do, and to make me go back and try something new. What got me excited though was the cucumber-yogurt soup. Light, fresh, with a bit of that yogurt tart. Some chives for a few fun spikes of flavor. Perfect for a hot humid day. I’m sure it’s a simple recipe; I’m going to have to hunt for one and make it for the next roommate dinner. On a final note, the atmosphere at Pescatore is clam and pleasant. And staff actually spoke Italian. A server to two young Italian men at the table behind me and (shockingly) in the kitchen—there were actually people yelling at each other in Italian!